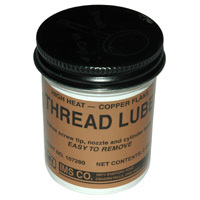 Thread Lube, Anti-Seize Copper Flake, 2oz. Brush Top Container. Carrier Grease Good to 350 deg F in Air, Or 750 deg or More W/O Air Contact. Remaining Copper and Graphite Effective to 1981 deg F.